Going from average gamer to gaming legend takes power that doesn’t call for reinforcements. 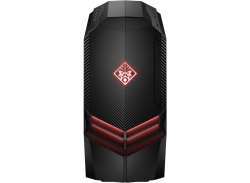 The omen desktop is geared with a cutting edge design, the industry’s latest hardware, and easy upgradability to crush the latest AAA titles, and give you the top tier performance competition demands. All-around edge vents, two 120mm fans, and optional liquid cooling help ensure when you’re on fire in-game, your desktop won’t become a molten core. Top that off with a machine-like design and at-the-ready carrying handle, and it’s game over.